You've seen Tricolor Potatoes as the centerpiece of the produce section at upscale groceries or at your local farmer's market, but there's no reason to leave your home to experience their mouthwatering flavor. We'll deliver a trio of roasted red, yellow, and purple pearl potatoes right to your door. 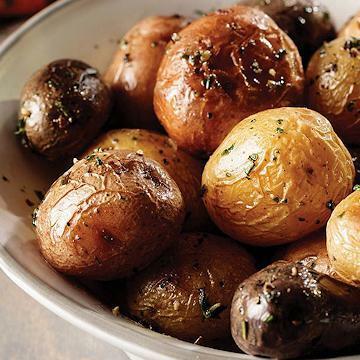 Our Tricolor Potatoes are served in a rich brown butter sauce with hints of garlic and sage. And each bite gives the crisp exterior and smooth, creamy center that only you only get with roasting. You'llenjoy the red pearl potatoes for their sweetness, the yellow pearl potatoes for their buttery smoothness, and the purple pearl potatoes for their subtle, natural earthiness. And we balance all three potato varieties within this special blend, giving you the perfect amount of each in every portion. Best of all, with our Tricolor Pearl Potatoes in Brown Butter Sauce, there's no prep necessary beyond preheating your oven. After that, this one-of-a-kind side is done in minutes. KEEP FROZEN: COOK THOROUGHLY: Appliances vary, adjust cook time accordingly. FOR FOOD SAFETY AND QUALITY, FOLLOW THESE COOKING INSTRUCTIONS. FOOD MUST BE COOKED TO AN INTERNAL TEMPERATURE OF 165�F AS INDICATED BY A FOOD THERMOMETER. DO NOT MICROWAVE. OVEN: Preheat oven to 400�F. Remove plastic wrap from tray and discard. Place tray on a foil lined baking sheet. Place baking sheet on the center rack of the oven. Bake for 25 minutes, stir potatoes and return to oven for 20-25 minutes or until product reaches 165�F. Ingredients: Tri-color Baby Potato, Unsalted Butter (Cream, Natural Flavor), Garlic, Sage, Canola Oil, Salt, Black Pepper.